President's Council of Economic Advisers: The Bureau of Labor Statistics (BLS) released its monthly Employment Situation Report today, which shows continued evidence of a strong labor market. 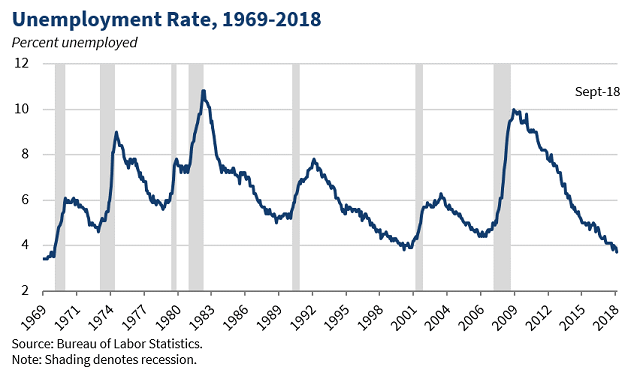 The U.S. unemployment rate is now the lowest it has been in nearly 50 years, payroll employment continued its historic streak of positive jobs gains, and average weekly wages continued to rise. Overall, the surveys released by BLS today offer more evidence of a booming United States economy and a strong labor market. The Council of Economic Advisers is an agency within the Executive Office of the President. It is charged with offering the President objective economic advice on the formulation of both domestic and international economic policy. The Council bases its recommendations and analysis on economic research and empirical evidence, using the best data available to support the President in setting our nation's economic policy. Tags: Bureau of Labor Statistics, BLS, Unemployment Rate, 3.7 percent, Lowest Level, in almost 50 Years, White House, Council of Economic Advisors To share or post to your site, click on "Post Link". Please mention / link to the ARRA News Service and "Like" Facebook Page - Thanks!